The first day of autumn brought cold and often heavy rains to much of Idaho and Montana which have been on fire since mid-July. Many fires will smolder on. 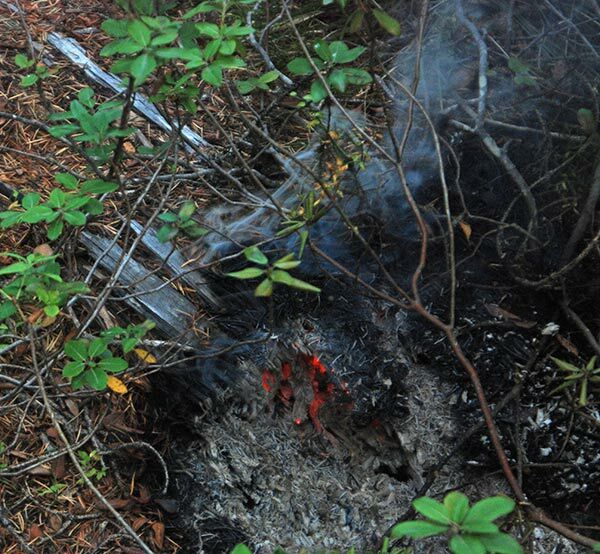 It’s amazing how once a fire gets started in “heavy fuels,” meaning very dry (inside) logs, it can continue to slowly burn despite exterior conditions adverse to fire. I took this photo of a very old smoldering log at the Bridge Fire (near Elk Summit in the Bitterroot Mountains) this September. It was early in the morning, the forest floor was damp from dew and the temperature was about about 1 degree C. above freezing (34 F.). Many logs lying in still green grass had been completely consumed without burning the grass upon which they laid. Photo by Ralph Maughan. If the temperature gets up into the 70s F., and a strong wind blows for a few hours, some of these fires could return to torching trees and even making runs, but days are short now. I recall the great Yellowstone fires of 1988 burned until at least the end of October. I visited them, but the season ending event was a snowstorm Sept. 11. It’s highly likely there are wolves in the area. 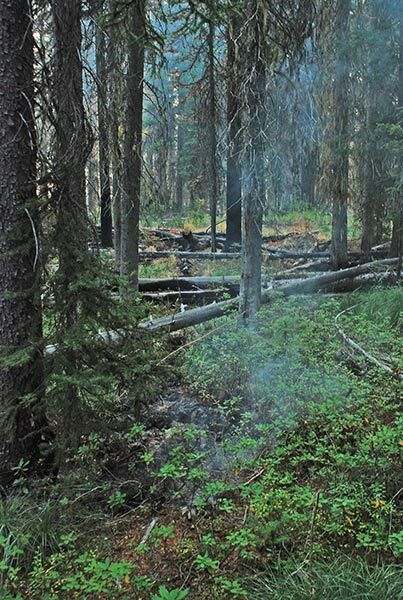 For years one or more packs have lived just south and/or just north of Lolo Pass. From there Elk Summit is an easy wilderness jaunt for them.